Discussions Magazine Music Blog: THE DOOBIE BROTHERS/Let The Music Play: Official Documentary now available on DVD & Blu-Ray! 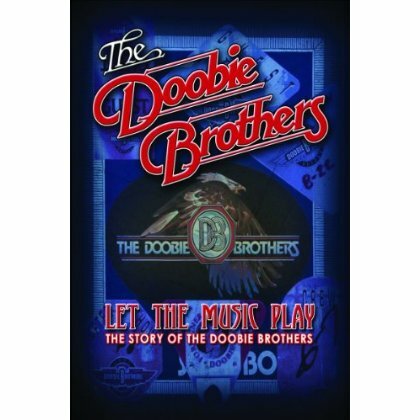 THE DOOBIE BROTHERS/Let The Music Play: Official Documentary now available on DVD & Blu-Ray! So, where's the respect and love for that motley Rock 'n' Roll band we call The Doobie Brothers? There's no denying the majesty of their string of early hits including "Listen To The Music", "China Grove", "Long Train Runnin'" and "Black Water". The band created a perfect blend of Southern Rock, Pop, Country, Blues, Soul and Rock 'n' Roll and sounded like nobody else. So, why aren’t they on top of every Classic Rock ‘favorites’ list, year after year? Their songs rival anything from the catalogs of their ‘70s contemporaries like Black Sabbath, Boston, The Eagles, Steely Dan, Aerosmith and Deep Purple. They sold millions of albums and singles. They became one of the biggest bands of their era. Even with all of their achievements over the years, they don’t receive the respect they so rightly deserve. Now, don’t get me wrong: people LOVE the Doobie Brothers. Almost everyone I know can name at least a few Doobie songs quicker than they can name a Sabbath tune… and they can usually sing the chorus to those songs as well. The problem I have is that the Doobs deserve more. They deserve to be immortalized in bubblegum cards, iPhone apps and viral YouTube videos and they definitely deserve to have have highways and hoagie sandwiches named in their honor. And “Listen To The Music” needs to replace “The Star Spangled Banner” as our national anthem. Forget about their appearance on What’s Happening (“Which Doobie you be?”). Forget that Michael McDonald eventually shed his Classic Rock and Soul roots and became more of an adult contemporary artist. Forget all the nonsense and just imagine a bunch of extremely talented friends smoking a few joints, plugging in their guitars and creating some of the greatest Rock music of our generation. During a 24 month period that saw a new album (World Gone Crazy), the untimely death of drummer Michael Hossack, reissues of their back catalog and more general activity than usual, along comes this fantastic documentary that will hopefully earn the boys a lot more respect. Containing rare and unreleased footage plus interviews with all the key surviving members (including Tom Johnston, Pat Simmons, Tiran Porter, Jeff Skunk Baxter, Michael McDonald, etc. ), Let The Music Play is the perfect re-introduction to a band that we all know and love. For us fans, it could have been an hour or two longer, but I’m not going to complain because it actually does answer some questions that have roamed the halls of my brain for ages, so it definitely delivers. Well, apart from when they skim over the severity of Tom Johnston’s illness in the mid ‘70s. Perhaps I was temporarily mummified during this part of the documentary and missed it, but they talk about TJ getting ‘sick’ and make references to it, but its not really explored as well as it should have been. Maybe it’s a private issue and nobody wanted to talk about it, but it’d be nice if they discussed it a little more. But that’s a minor complaint. Interestingly enough, many of the people interviewed seem to view The Doobs with Tom Johnston and The Doobs with Michael McDonald as two separate, but linked, identities and not merely a continuation of an ever-evolving band. This way of thinking makes total sense in hindsight, but I’ve always thought of them as one and the same. I just preferred the Tom Johnston years over the MM years. But there’s no denying that McDonald’s “What A Fool Believes” (amongst others) is an amazing tune…. And what do you mean you have no idea what I’m talking about when I mention the Tom Johnston era and Michael McDonald era? Perhaps you need to sit down and watch this. NOW! Perfect for music fans. Perfect for Doobie fans. Perfect for Michael McDonald fans. Perfect for Classic Rock fans.